BENEFIT COSMETICS High Brow highlighter - Give Me Gorgeous! 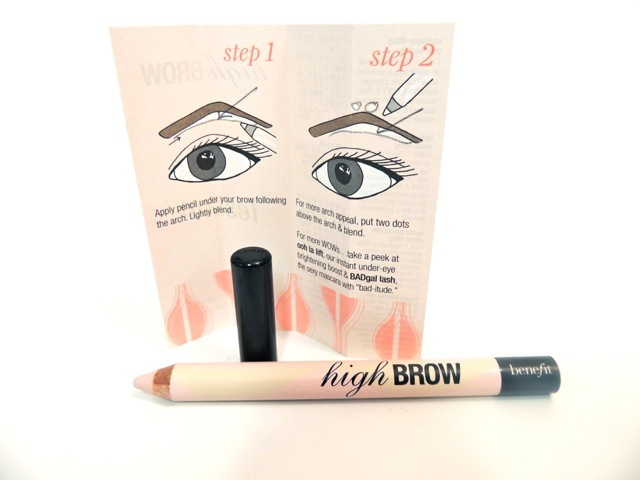 High Brow is a matte highlighting pencil that can be used under the eyebrows and the inner corner of the eye to brighten eyes. The packaging says its ‘a brow lifting pencil.’ I wanted a highlighter that would not be too noticeable, sparkly or iridescent. The pencil is a subtle natural color, just barely pink and does a nice job of illuminating the eye area without looking obvious. I like that the product blends easily, is creamy, and the color can be gently smoothed with your finger tip or a cotton swab so that there are no hard edges. Also adding a bit of highlighter to the inner corner of the eye picks up the white of your eye in effect brightening your look. I recommend this as a finishing touch on your makeup routine to add extra polish. Below, I drew circles around the recommended areas to use this highlighter (in the instruction diagram), and arrows – to notate it a little better. They recommend drawing a line under each brow and making a couple small dots above the crest of each brow, before blending.